Set by the sea, our Worthing team are true professionals and are always happy to help, offering impartial, tailored advice. Coole Bevis LLP Office is located in The Steyne, 7 minute drive from Worthing town centre via High St/A259. Coole Bevis Worthing office is a 2 minute walk from High Street Car Park in Worthing. Worthing is a seaside town located in West Sussex in England. It is located at the bottom of the South Downs (a range of chalk hills that extend more than 200 miles across the south-east coast of England), about 16 kilometres west of Brighton and 29 kilometres east of Chichester. 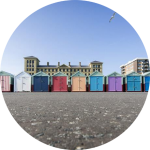 Worthing is situated 79 kilometres south of London and 16 kilometres west of Brighton and Hove and is part of an area that is the twelfth largest conurbation in the UK. Worthing is bordered by the West Sussex local authority district of Adur in the east and Arun in the north and west. 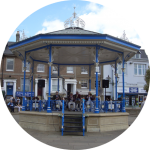 With its population of more than 100,000 and an area of more than 12 square miles, Worthing is the second largest section in the conurbation made up of Brighton, Worthing and Littlehampton. Worthing is the most densely populated local authority district in East and West Sussex has experienced dramatic population growth multiple times. Worthing is also the 15th most populated urban area in the United Kingdom. Worthing is the 29th largest town in the UK, directly under Eastbourne at number 28. The area surrounding Worthing has been populated for thousands of years and contains some of the greatest concentration of Stone Age flint mines in Britain. Iron Age hill fort of Cissbury Ring located inside the borough is one of the largest hills in Britain and where some of the more popular Bronze Age barrows were found. Cissbury Ring rises to an impressive 604 feet in the north of the borough, while of even importance is the West Hill, north-west of Salvington which is about 450 feet high. In the past, Worthing was the biggest garden market in Britain, but today it has a large service industry with a large financial sector. The larger part of the town including the town centre is built on chalk while a bed of London clay can be found heading west from Lancing, passing through Broadwater and Durrington. Worthing has no major river, however, Teville Stream runs along Tarring Road to Teville Road towards the centre of town before joining the sea at Brooklands where Broadwater Brook also joins the sea. To the west of the borough, Ferring Rife passes through Maybridge from Durrington then veers to the west of Ferring were it joins the sea also. In the southwest of the borough lies Goring Gap, a protected area of woodland and fields strategically located between Goring and Ferring. And to the east lies Sompting Gap (formerly an inlet of the sea where Broadwater Brook flows through Brooklands Pack and into the sea), a protected area that lies between Worthing and Sompting. Though Worthing has no nature reserves, the closest being Widewater Lagoon in Lancing, some of the reedbeds in Sompting Gap are designated as a Site of Nature Conservation. 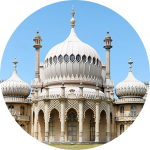 Worthing has about 50 active Christian worship centres and a mosque of the Sunni Muslim sect. There are also a number of former church buildings which are now disused or in use for secular purposes. St Paul’s, Worthing’s first Anglican Church was built in 1812 and is said to be the spiritual and social centre that served as the basis of the town’s development. St Mary of the Angel’s Church is the first Roman Catholic Church in Worthing and was opened in 1864; it has since been joined by others in other area of the town. At the end of the 1990s, Worthing was voted the most profitable town in Britain for the third consecutive year. In 2008, the town earned a slot in the top 10 urban areas for jobs in each key sector in England. These are the sectors thought to play a critical role in the economic performance of the nation. In 2012, Santander UK ranked Worthing as the second highest town in the UK for connectivity; the town also ranked fifth out of a total of 74 UK towns and cities. Worthing has five railway stations: Worthing, East Worthing, West Worthing, Durrington-on-Sea and Goring-by-Sea, all of which are managed and operated by the Southern train company. Local flights within the UK take place from Shoreham Airport about 8 kilometres east of Worthing while international flights take place from Gatwick Airport in London. 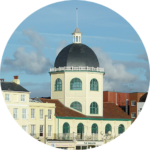 There are 213 listed buildings in Worthing, three of which are Grade I listed building. There are Castle Goring, The old Palace at West Tarring and St Mary’s Church at Broadwater. A number of literary figures have lived in or visited Worthing at one time or another. Some of the more familiar names include Oscar Wilde, Harold Pinter, Dorothy Richardson, Jane Austen and John Selden. Oscar Wilde wrote “The importance of being earnest” while staying in Worthing during the summer of 1894. Worthing has three theatres and one of the oldest cinemas in Britain. Gwendoline Christie was born in Worthing in 1978. She played the part of Brienne of Tarth in the movie Game of Thrones.